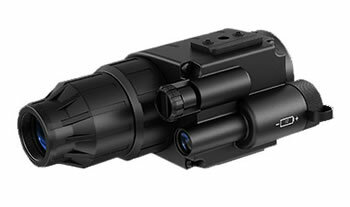 The Challenger GS 1x20 is a multifunctional night vision device. The Challenger GS 1x20 has a number of applications. It can be used as a night vision monocular, night vision goggles (if set up on a Head Mount; the device can be used either for the right or the left eye), and a night attachment for a day optical riflescope or a collimator sight. N.B. These units can be fitted to a multitude of scopes (using the 79041 Day Scope adaptor), but the scope that you are fitting it to, must have parallax adjustment, so that when you add the NV unit, it can be focussed correctly. At the core of the Challenger GS 1x20 is the unique combination of specially designed optics and the CF-Super Image Intensifier Tube which ensure highest edge-to-edge resolution, clear, distortion-free and geometrically precise image across the entire field of view. The Challenger GS 1x20 is equipped with a wide-angled short range infrared illuminator but it has a matching site to install auxiliary, more powerful, focusable IR Illuminators Pulsar. The device and the built-in IR illuminator are switched on/off with a single switch. Design of the switch prevents the IR illuminator from accidental activation (to avoid disclosure of the observer). The Challenger GS 1x20 boasts a wide range of applications, such as nocturnal walks on foot or by bicycle, night orientation, tourism, hunting, guard of industrial facilities and private property, military and sport games, patrolling and rescue operations. Generation - Gen Super/CF-Super, Magnification - 1x, Field of view - 36°, Resolution - 236 l/mm, Lens diameter - 20 mm, Dioptre Adjustment - +/-4 D, Exit pupil - 6mm, Eye relief - 12 mm, Degree of protection - IP code IP46, Tripod Mount - 1/4", Battery - 1 x CR123A, Dimensions - 163x79x57mm, Weight - 400g. Pulsar Challenger GS 1x20 Generation CF Super Night Vision Monocular, Pouch Case, User Operating Instructions Manual, Manufacturers Warranty. At the core of the Challenger GS 4.5x60 is the unique combination of specially designed optics and the CF-Super Image Intensifier Tube which ensure highest edge-to-edge resolution, clear, distortion-free and geometrically precise image across the entire field of view. The body of the device is hermetically sealed which enables use in inclement weather (fog, heavy shower, dusty environment, etc.). The Challenger GS 4.5x60 is equipped with a powerful infrared illuminator that can be used in low light conditions for observation at over-average distances. The device also has a matching site to install auxiliary, more powerful, focusable IR Illuminators Pulsar. The device and the built-in IR illuminator are switched on/off with a single switch. Pulsar Challenger 4.5x60 Generation CF Super Night Vision Monocular - Lightweight and extremely durable compact body - Single switch operation - Water and dust resistant - Main and IR-switch prevents inadvertent switching combined - Built in tripod 1/4" socket - Generation Super/CF-Super Image tube for sharp-edge, high-contrast image. Pulsar Challenger 4.5x60 Generation CF Super Night Vision Monocular, Pouch Case, User Operating Instructions Manual, Manufacturers Warranty. Featuring a built-in, energy-conserving, wide-angled IR illuminator, the Pulsar Challenger GS Super 1+ 2.7x50 Night Vision Monocular is designed for crisp and clear short-range, lowlight viewing. Equipped with two diametrically-positioned tripod sockets, this state-of-the-art night vision monocular allows for head mounted observation (left or right eye), mounting on a 1/4-inch tripod socket, and is also weapons mountable. 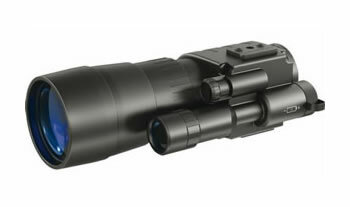 Outfitted with a five-lens eyepiece, the Pulsar Challenger GS Super 1+ 2.7x50 Night Vision Monocular minimizes distortion on the edges of the field of view and increase sharpness and contrast of the image. Its durable, fiberglass reinforced plastic housing enables reliable use in inclement weather conditions such as thick fog, heavy shower, dust, sand storm, etc. The Pulsar Challenger GS Super 1+ 2.7x50 Night Vision Monocular operates by a single-switch control, offering ease of use and preventing accidental activation of the IR illuminator.